Once you've learnt the knitty gritty (couldn't help myself) then you'll be away. 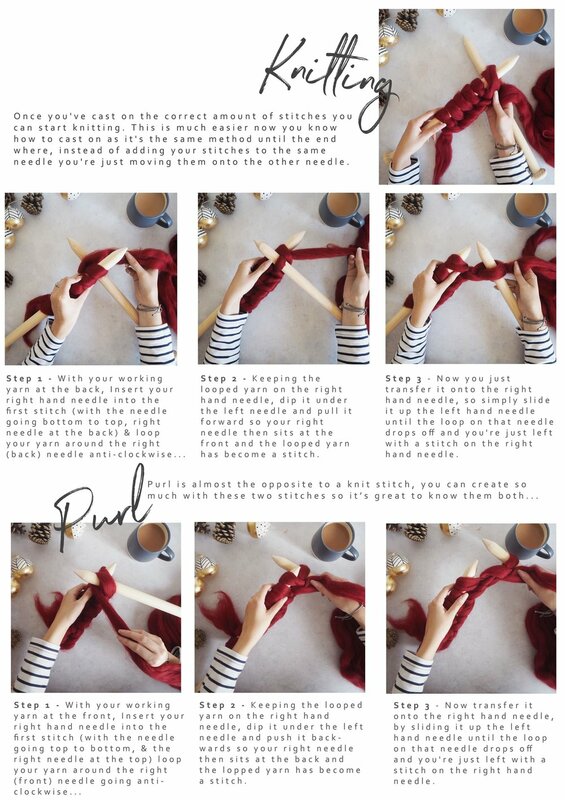 A scarf is always a fun starting point as it's just a straight line, simply cast on the amount of stitches you fancy and knit knit knit until it's long enough. With Christmas around the corner, knitting is a brilliant skill to have as you can make your presents (both thoughtful and fabulous) so if you're feeling mildly confident with your new knittings skills then I've also written up the pattern for this spiffy hat ^ It's a quick and easy pattern that just uses 2 basic stitches which you'll know from the 'how to knit guide'. I whipped mine up in a couple of hours in front of the TV and even better is that it only uses 90g of yarn so with 1 hank of yarn you can make 2 hats in 4 hours and it'll only cost you £15 in materials (and don't make me bang on about how beautiful merino wool is AGAIN...All I'll say is Hypoallergenic and stunningly soft!) and you could even use the left over to make a pompom and fix it to the top! When it comes to buying your yarn - If you want more than 1 colour don't forget to use the yarn bundles listing where you can save the more you buy (double thumbs up) I'm so excited about alllll the hats! 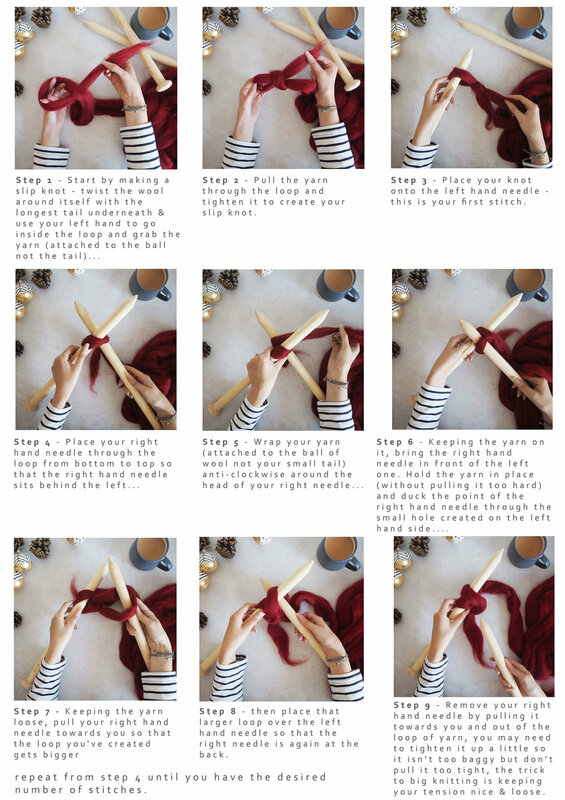 So... before you start knitting your hat, you'll need to know how to knit! I know there are a lot of you out there who are all experienced knitters so you can go straight to downloading the pattern, but for those of you who need a little help, please find below three handy print-outs. Enjoy your new found skills and keep me posted with how you get on! And don't forget to sign up to my newsletter to get your free chunky hat pattern!